A cluster of thunderstorms has organized east of the South Carolina coast. The complex has organized enough to be classified as a tropical storm. 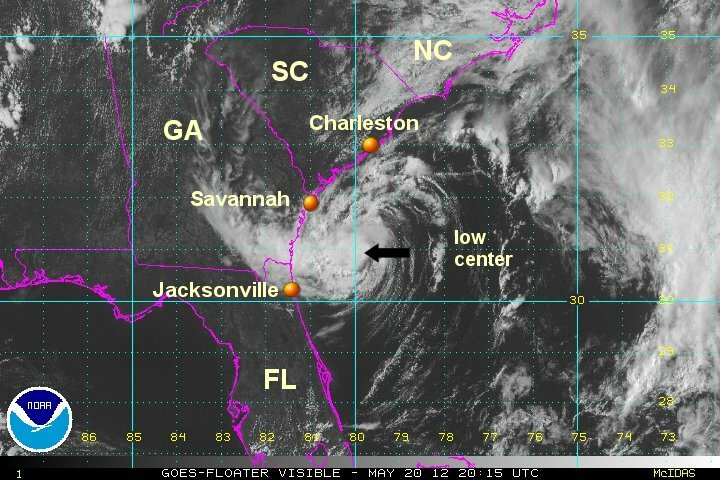 As of 5 pm edt Alberto was centered at 32.2 N / 77.7 W or about 140 miles ese of Charleston, South Carolina. It was moving sw at about 3 mph. Top sustained winds estimated at 45 mph ( 45 mph NHC advisory). Pressure was estimated at 1007 mb. Forecast models drift Alberto toward the coast, then move northeast. 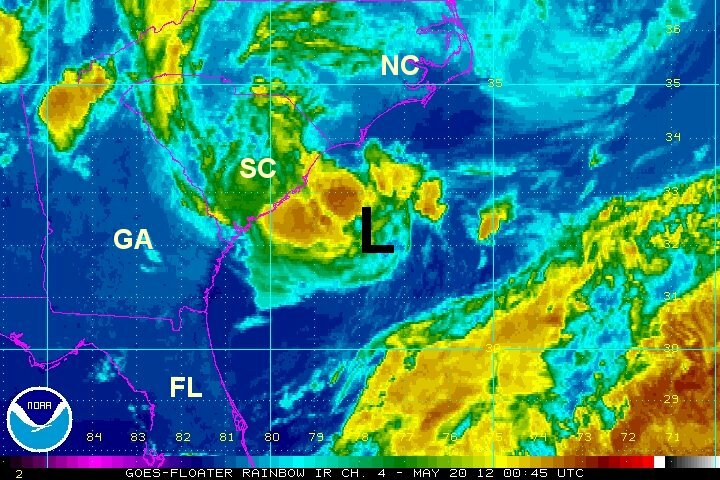 This should take Alberto on a parallel track offshore of the South and North Carolina coast. 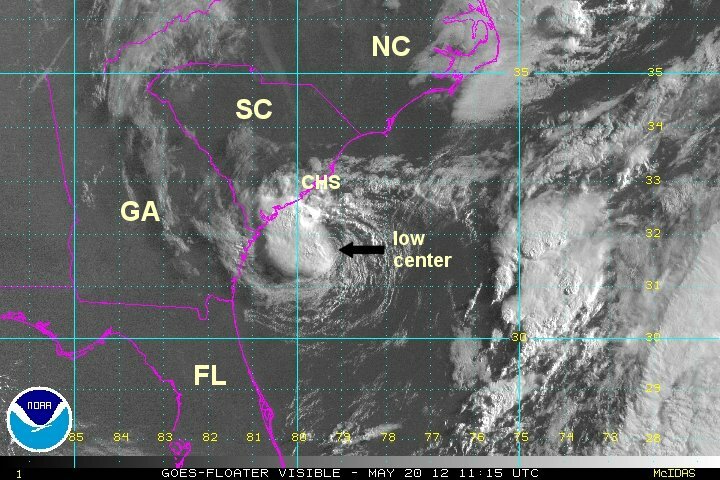 Visible satellite imagery this morning show that Alberto is facing easterly wind shear. The eastern half of the storm is exposed. Despite this, a little more organization has occured and we concur with NHC that Alberto is slightly stronger. Radar shows some rain just south of Charleston. As of 8 am edt Alberto was centered at 31.7 N / 79.3 W or about 95 miles sse of Charleston, South Carolina. It was moving wsw at about 6 mph. Top sustained winds estimated at 50 mph ( 50 mph NHC advisory). Pressure was estimated at 998 mb. Forecast models drift Alberto a little more toward the coast, then move it northeast. This should take Alberto on a parallel track offshore of the South and North Carolina coast. The greatest threat will be for some breezy conditions on the coast of North Carolina, with a few heavy showers possible in rainbands as Alberto passes to the east. Alberto drifted more wsw than models expected today, taking it off of the Georgia coast. For a while wind shear threatened to tear it apart. The winds have relaxed some and now deep convection is again over the center of circulation. Alberto remains a minimal tropical storm. As of 5 pm edt Alberto was centered at 30.9 N / 80.0 W or about 105 miles sse of Savannah, Georgia / 130 miles south of Charleston, SC. It was moving sw at about 6 mph. Top sustained winds estimated at 45 mph ( 45 mph NHC advisory). Pressure was estimated at 1006 mb. Forecast models are not handling Alberto well with it moving more sw than the official hurricane center forecast. 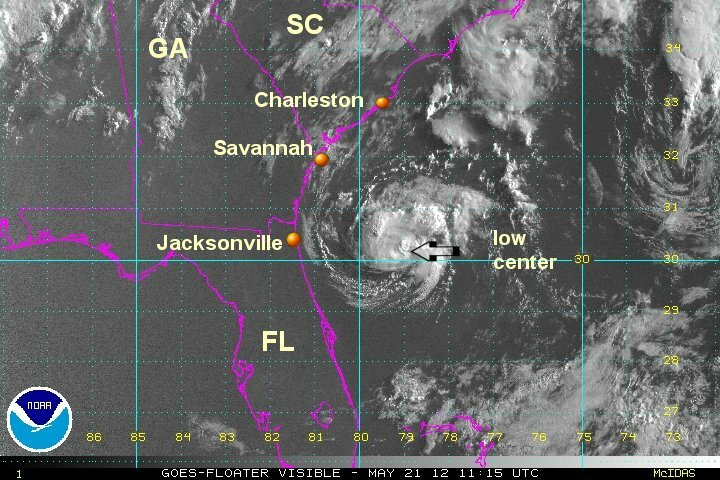 Alberto has slowed this afternoon and should start moving northeast soon. This should take Alberto on a parallel track offshore of the South and North Carolina coast. The greatest threat will be for some breezy conditions on the coast of North Carolina, with a few heavy showers possible in rainbands as Alberto passes to the east. 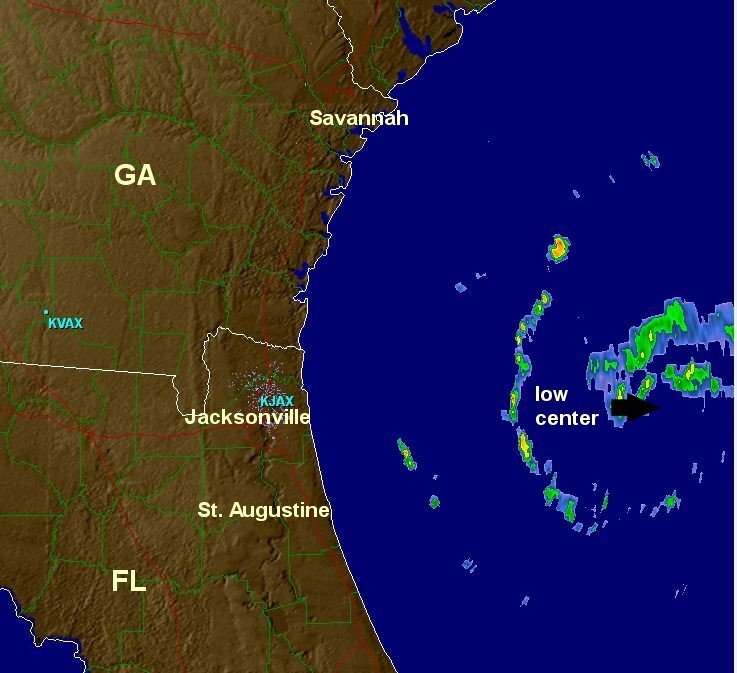 Alberto continued to drift farther south than models predicted - now off of the north Florida coast. Visible satellite from this morning still show a minimal tropical storm. Cool water temperatures this early in the season as this latitude can not support a strong tropical system. 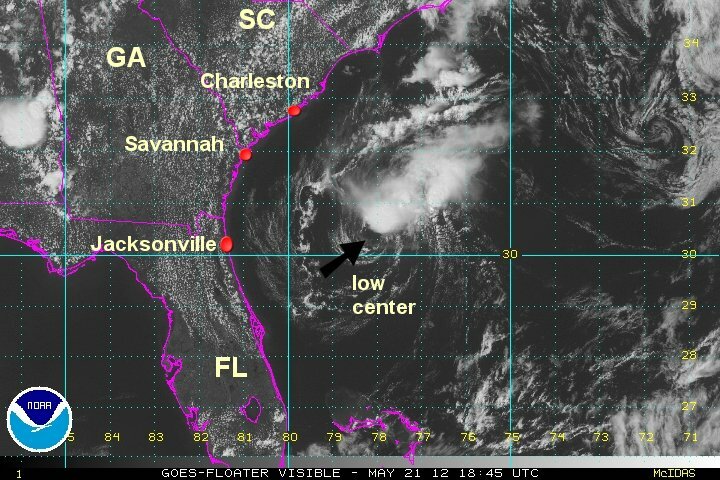 Alberto has seen a bit of a comeback with convection and should start pulling away from the coast. Buoy data indicates seas up to about 6 feet. Wave models show top seas in the 10-15 foot range near the low center. Rainbands are now east of the north Florida coast by about 50 miles and pulling away. As of 8 am edt Alberto was centered at 30.4 N / 79.7 W or about 105 miles ene of St. Augustine, FL / 165 miles south of Charleston, SC. It was moving sse at about 5 mph. Top sustained winds estimated at 40 mph (40 mph NHC advisory). Pressure was estimated at 1006 mb. Forecast models continue to take Alberto northeast over the next couple of days. This should take Alberto on a parallel track offshore of the South and North Carolina coast. Impacts to the coast should be minimal. Seas will be a little higher than normal. There still could be a rainband on the Southeast coast as Alberto moves by into Wednesday. Alberto is badly sheared and remains a minimal tropical storm. In fact, 40 mph may be generous for top sustained winds. The latest buoy data shows a decrease in seas with the highest seas likely under 10 feet. Most seas are in the 4-6 foot range. On the coast it is a beautiful day with no notion of a tropical storm offshore. As of 4 pm edt Alberto was centered at 30.5 N / 78.2 W or about 210 miles east of Jacksonville, FL / 200 miles sse of Charleston, SC. It was moving ene at about 10 mph. Top sustained winds estimated at 40 mph (40 mph NHC advisory). Pressure was estimated at 1008 mb. Tropical depression Alberto continues to be sheared. It is a weak system and not a threat to the coast. This will be the last update on Alberto.